The SHAPE DSLR Kirk Neff Baseplate + Cage 2.0 is a baseplate and half-cage integrated into one unit and featuring an adjustable top handle assembled on top. It features a V-lock delta receptacle on the baseplate and includes a V-lock adapter that attaches to your DSLR and allows quick release mounting/dismounting. The top-handle rotates a full 360° at the press of a push-button on top. Two 8" 15mm rods are included for attaching a follow focus, matte box, and other accessories. They insert into rod ports at the bottom of the baseplate and secure into place by a single ratcheting lever. All the components are positioned to provide precise optical centering. 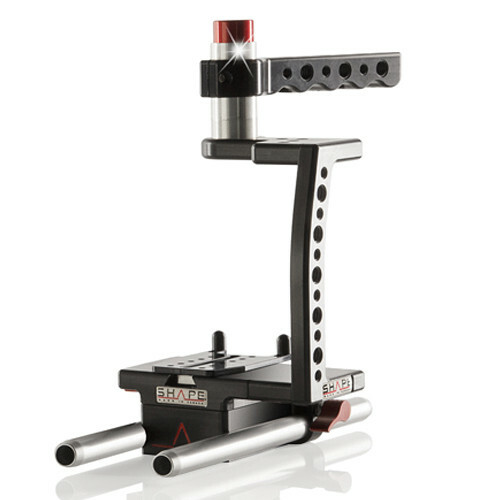 The baseplate offers 1/4"-20 and 3/8"-16 tripod mount threads on the bottom, and the top handle and side cage feature 1/4"-20 and 3/8"-16 accessory mounting threads. The V-lock adapter attaches to the bottom of your camera along with a thin camera plate, also included, using a supplied 1/4"-20 screw. The camera plate has stoppers on the back that will keep the camera from twisting sideways. The plate and the stoppers are both adjustable to support different-sized cameras. An alignment screw secures the plate in place. When the camera is mounted on the baseplate, a simple push of a release button on the side releases the V-lock adapter from place and allows you to remove your camera. Box Dimensions (LxWxH) 14.173 x 6.063 x 4.882"